Prophylaxis and prophylactics: better together? Preventing HIV: From how? to who? Thirty years ago, if you were infected with HIV, you got AIDS. And then you died. Period. Things have sure come a long way since then. First, AIDS cocktails became available in 1995 and the death rate from the infection dropped for the first time ever. By the early 2000s, much better "AIDS cocktails" were approved, one after another, and the face of the disease no longer bore any resemblance to the nightmarish scene from just a few years before. Some of the drugs there are more than 30 of them now were so good that by 2010, the predicted life expectancy of HIV-positive and HIV-negative people was similar. This is arguably the greatest medical advance in a generation. The news just keeps getting better. The HIV inhibitor cocktails now used are so good that they stop HIV from replicating so well that most people who are taking them have HIV levels that are BQL below quantifiable levels. Even with highly sensitive tests that measure viral RNA, no trace of HIV can be seen. That's pretty amazing. Not only does this protect the HIV-positive individual, but it also dramatically cuts the risk of transmission from HIV-positive people to their HIV-negative partners. This was first demonstrated in clinical trials in Africa, something the American Council on Science and Health wrote about back in 2011. Not only did everything that I predicted then come true, it turned out to be far better than anyone, including me, predicted. A New York Times article about prophylaxis preventing transmission in serodiscordant (one HIV-positive, one negative) couples- discusses study results that are astounding. Over the course of two years, of the 673 HIV-negative gay men in San Francisco who received pre-exposure prophylaxis (PrEP), 673 remained uninfected, despite a decline in condom use in gay men in general. There is not (and may never be it's been 34 years) an AIDS vaccine, but PrEP is acting as a pill version of a vaccine, and with 100 percent protection. For those of us who have followed (and participated in) AIDS research from the beginning, this was once believed to be in the realm of science fiction. From the 9th annual International AIDS Conference in Berlin: "Unfortunately 1993 is a disappointing year in HIV research: the results of the Concorde trial of AZT monotherapy shows no medium- or long-term benefit; also, the economic impact of AIDS epidemic is becoming more and more obvious." 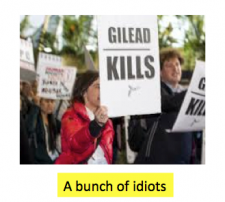 Gilead is the company that has led the way in stopping HIV in its tracks, and in curing hepatitis C. They shouldn't be criticized, they should be applauded.